"Every dream deserves a fighting chance." 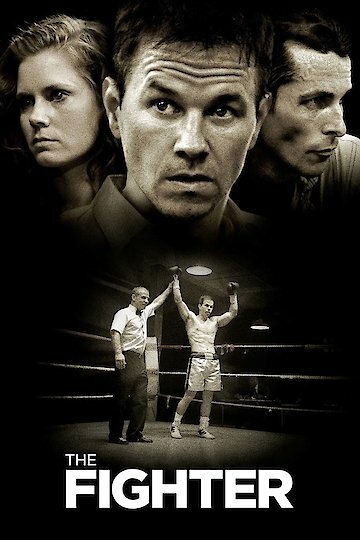 The Fighter is a sports-drama film filmed by Relativity Media and Mandeville Films about a former boxer named Micky Ward who gets to the welterweight world championship with the help of his step-brother and former boxer, Dicky Eklund. The story is about a welterweight boxer named Micky who lives in Lowell, Massachusetts. He has had an unfortunate career and is waiting for his fame. At first, he thinks his opportunity to reach the peak of his fame has come when he is scheduled to fight to fight in Atlantic City; he loses the fight and retreats to normal life and finds himself a girl. However, he is offered to go back to the ring on condition that his mother and his brother do not get involved in his business. After his brother's incarceration, he trains with the local security guard and his step-father, winning a few fights and creating himself an opportunity to be a welterweight champion, but only because he follows his brother's advice towards the end of the fight. When his brother returns from prison, Micky is faced with a dilemma; his coach and his girlfriend do not want the mother and the step-brother involved in the fight, but he does. Eventually both sides reconcile and help Micky go to Great Britain to fight for the world welterweight title. Using the same tactic that his brother taught him, he fights an undefeated boxer. Mark Wahlberg stars as Micky, while Christian Bale is the step-brother, Dicky Eklund. Amy Adams plays Micky's girlfriend, Charlene, and Melissa Leo plays Micky's mother, Alice Ward. The movie was written by Keith Dorrington but later edited by Scott Silver and Paul Tamasy. The original budget of the movie was about $25 million; after the release of the movie, approximately $105 million dollars of profit was made. The Fighter is currently available to watch and stream, download, buy on demand at Netflix, Amazon, Vudu, FandangoNow, iTunes, YouTube VOD online.